located just down the street from all the hustle and bustle that is the melrose m cafe, there’s a much less crowded unassuming macrobiotic restaurant called inka. the natural foods restaurant is almost entirely vegan, except for some seafood options, and the food is prepared entirely with healthy and organic ingredients. while the cuisine is light and simple, it isn’t lacking in taste, and is provides a welcome rest from processed and artificially flavored food. i took a trip to inaka recently with fellow vegan food blogger/vegan chef/vegan baker jennshaggy, and we both enjoyed our meals tremendously. we ordered a few dishes, and naturally ended up sharing everything. jennshaggy went with the yakisoba noodles, with the choice of udon rather than soba. i’m used to udon noodles being thick and round, like the stuff i get in packages at the supermarket and put into soups, but these noodles were much more wide and flat. they tasted slightly fried and a little oily, but still very light at the same time. the vegetables which included carrots, celery and broccoli were crispy and perfectly cooked. the only thing this dish could have used in my opinion is a huge bottle of sriracha sauce, but hey, i use that stuff like ketchup. overall very tasty. we also got the hijiki salad, which was basically a mixed green salad piled high with the dark sea vegetables. everything was extremely light and tender, and incredibly fresh. 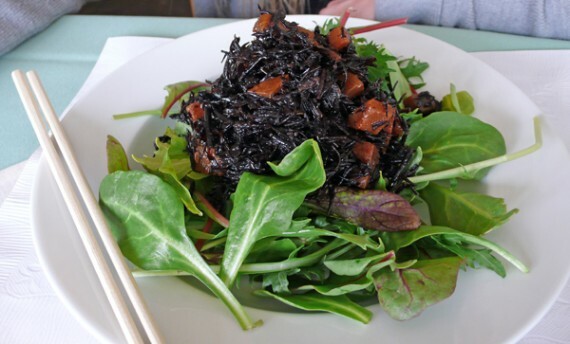 the salad had little to no dressing, so the sea vegetable taste was very prominent. i think this salad ended up being the best thing at the table, just because it had a pure and unique vegetable taste. 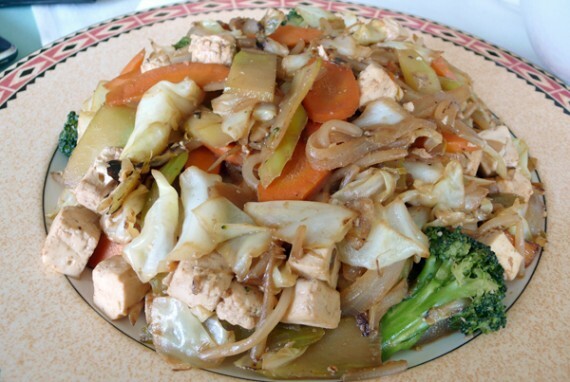 i ordered the wok fry vegetables and added tofu to them for an additional 2 bucks. while this dish was delicious, i can’t really say it was worth $15. sure, everything was well prepared and the vegetables were crunchy and flavorful..but the tofu was a bit soft and boring. i dunno, it tasted like something i could make at home. next time i hit up inaka, i will opt for something with loads of exotic vegetables, you know, macrobiotic-sounding things i can’t pronounce rather than onions and napa cabbage. 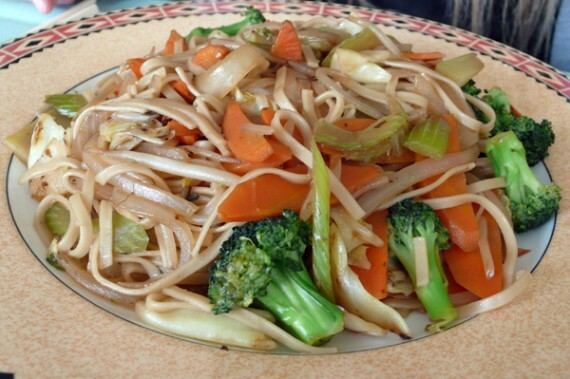 however, if you are looking for a simple and mild stir-fry…this dish is your man. overall, i thought inaka was pretty decent. jennshaggy, an extreme foodie was very impressed with the place, and that goes a long way. while some of the food at inaka is a bit boring and arguably overpriced, they make up for that with simple dishes containing delicious vegetables. stuff like the hijiki salad stands far above meals i’ve gotten at other restaurants. i guess it just depends what you order. 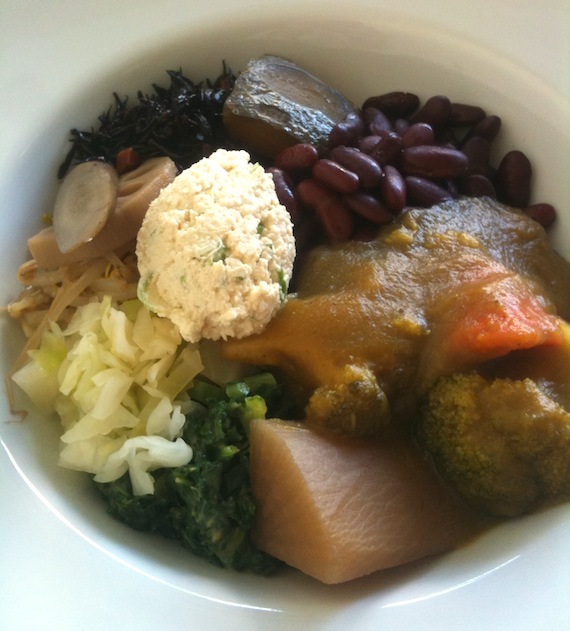 i will be back to inaka again very soon to partake in some fine macrobiotic vegan cuisine. try this place out next time you can’t get a seat at the crazy-popular m cafe…at least at inaka you can relax and have a quiet meal. lunch 12:00 noon to 2:30 p.m.
dinner 6:00 p.m. to 9:45 p.m.
sat 5:30 p.m. to 9:45 p.m.
sun 5:30 p.m. to 9:00 p.m.